The RAPDx device objectively, comfortably, and quickly assesses pupil responses in ways and in detail that human observers can't. When a defect is present, the differential response between the two eyes may help your doctor discover the presence of important conditions. The historical method is subjective and requires a quite large defect in order to be detected. RAPDX is a new diagnostic instrument that identifies relative afferent pupillary defects(RAPD) important in the diagnosis of optic nerve diseases such as multiple sclerosis , glaucoma and optic neuritis. The RAPDx device objectively, comfortably, and quickly assesses pupil responses in ways and in detail that human observers can't. RAPDX quantifies the neuro-pupil response far more accurately than human observation allowing identification and quantification of defects not identified by standard testing. 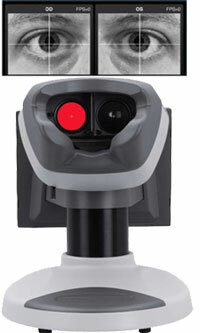 RAPDx is a pupillograph utilizing a high-definition, machine-vision system. Historically, the best tool that your doctor had available was a flashlight to assess if your pupils worked normally. The problem with the manual method is that is difficult to do well and requires a fairly large defect to be seen. These are defects that human observers cannot see using historically available methods. RAPDx measures very small characteristic differences in pupil responses to novel stimuli. As your doctor we normally look for these differences manually but can only assess one eye at a time in a dimly lit environment, and they are often challenging to see. Viewing both eyes responses together to controlled stimuli in very high detail allows us as doctors to see new detail regarding "Relative Afferent Pupillary Defects" or "RAPD" and other important features that were not measurable before. 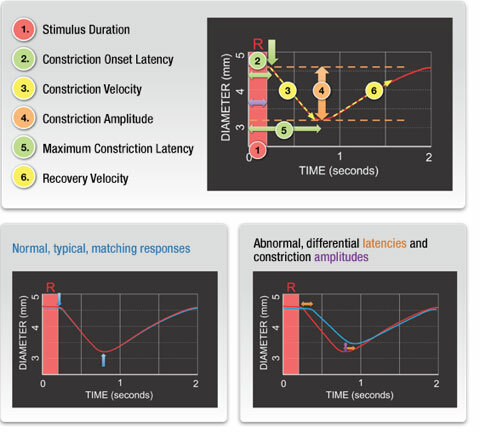 These responses are recorded over short times to form a "RAPDx Signature™" as a biometric waveform, much like an EKG, but of pupil responses, recording differential responses (amplitudes, latencies, and velocities). Humans can't see this level of detail without a machine vision system.